The continent of Magvel has fallen under the control of an invading Empire, and princess Eirika has been ejected from her rightful seat on the throne. She decides to retake her throne, accompanied by an army led by the knight, Seth. 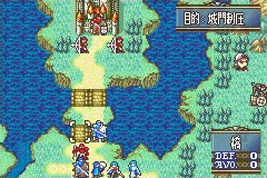 Like the Fire Emblem games before it, you must lead an army across the map, boosting each member's stats to make them stronger against enemies. Once all of your members have moved, the enemies make their move and the day ends. If you lose a character they are lost forever, but if you lose your leader, Eirika, then you fail the mission and must start over.